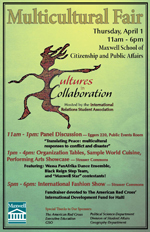 A full day of celebration and discussion and an exchange of culture will take place at the annual International Relations Student Association (IRSA) Multicultural Fair, “Cultures in Collaboration,” Thursday, April 1, at the Maxwell School of Syracuse University. The IRSA Multicultural Fair is intended to promote cross-cultural communication, multicultural education and an appreciation of cultural diversity through dance, music, storytelling, dialogue, cuisine, clothing, art and a general exchange of thought and personal experience. This year’s theme, “Cultures in Collaboration,” will bring together a wide range of student organizations, community groups and talented individuals to explore issues of diversity, conflict and cooperation. The panel discussion will explore the ways in which different cultures and nationalities approach conflict resolution and disaster relief. It will seek to advance an understanding of how cross-cultural education and sensitivity might play a role in successful disaster relief efforts and conflict resolution within and between multicultural communities. The panel will also explore how different cultures deal with the hardships of conflict and disaster. The Cultural Extravaganza is a forum for student and community organizations to promote cross-cultural communication, multicultural education and appreciation of cultural diversity through dance, music, storytelling, dialogue, cuisine, art and a general exchange of thought and understanding. The fashion show offers every participant an opportunity to display traditional clothing from a culture he or she chooses to represent. Those who are interested in sharing their talents at the performing arts showcase, would like to volunteer to help on the day of the event, or would just like to learn more about this year’s Multicultural Fair should e-mail the planning committee at culturalfair@gmail.com and join the event’s Facebook account.